A suitability model typically answers the question, Where is the best location?whether it involves finding the best location for a new road or pipeline, a new housing development, or a retail store. For instance, a commercial developer building a new retail store may take into consideration distance to major highways and any competitors' stores, then combine the results with land-use, population density, and consumer spending data to decide on the best location for the store. 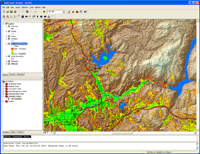 ArcGIS Spatial Analyst derives new information from the overlay of multiple layers, which can then be used to determine the best location.